Michael McFadyen's Scuba Diving - Christmas Tree The capital city of Papua New Guinea is Port Moresby, a lively city that sits on the waters of Port Moresby Harbour. The harbour is protected from the open sea by a barrier reef that extends right along the coastline of Port Moresby and the land to the west and east. South-west of the city is an island called Dango (Fishermen's) Island and outside this, a reef called Sinavi Reef. This reef makes up the western barrier to the harbour and is also the western side of the main entrance to the harbour, Basilisk Passage. 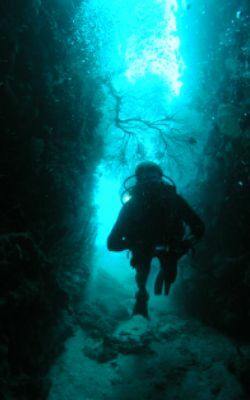 Christmas Tree Reef is on the outside of the reef and to get to this site, you travel out the main passage past the port channel marker and other dive sites like Shark Inn, Sinavi Bommie and Fishermen's Island South East Reef. It is about 15 minutes from the marina to this site. The reef here runs south-west to north-east. The top is quite shallow, only five metres deep. Before you leave the reef top, have a look around. It is quite bare, isn't it? Very little coral or gorgonias or, in fact, anything except a strange type of kelp (?) exists on the reef top. 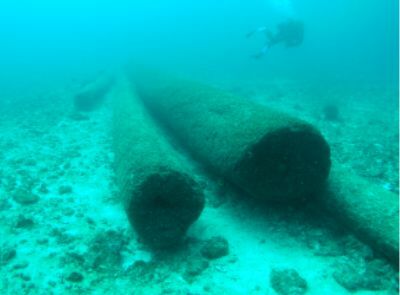 This is because a few years ago (late 1990s) a ship transporting timber made a grave error when entering Basilisk Passage and ran aground on the reef. It was apparently pushed a far way onto the top of the reef. A lot of the timber (in the form of logs) was either thrown overboard to lighten the load or it fell off as the ship tilted under the effect of the swell. Eventually, the ship was pulled off the reef. From the anchor spot, you swim over the wall to 10 or so metres and you will see the reason for the name of this dive site, a large bommie that looks a little bit like a Christmas Tree. From here the reef slopes to 30 metres, with a partly sandy bottom. Along the way you will see at least six of the huge logs that came off the timber ship. As you get to the 30 metre level you will see a gully. This is named Mark's Ravine (after Mark Palmer, President of Port Moresby Sub Aqua Club). It is not too wide but drops to about 45 metres. There are a couple of very large gorgonias in the gully. The gully comes out on the side of a wall that drops to well over 55 metres and then slopes to who knows what. On the wall, head either east or west and start a slight ascent. There are a few sharks in this area, so keep your eyes open. We saw a couple of grey reef sharks and a couple of humpheaded wrasse. There is a lot of nice coral in this area and plenty of small tropicals. Once you have decided it is time to head back (I got into about five minutes decompression before leaving), head north over the deeper reef top. If you have headed west before leaving the wall, there is a bit of a ridge here that runs to the north. We found quite a few crayfish and a couple of eels in the holes of the reef. Following the right-hand side of the ridge brings you back to the area where the boat is anchored. Spend some time here, exploring the smaller wall. You should clear your deco while doing this. The fishlife was not too bad. I would have liked to spend a little more time on the deeper wall as this was very nice. A good dive. Visibility was 25 metres and the water temperature 25.5°C.